Silicone wristbands were first made popular i n 2004 by cyclist Lance Armstrong as a fundraising tool for the Lance Armstrong Foundation. The yellow silicone wristbands sold for this campaign were part of a program meant to raise funds for cancer awareness and research. By the summer of 2004, these yellow silicone wristbands were wildly popular, having generated more than $25 million dollars in the first six months after their launch. Since the launch of these popular silicone bracelets, other charities have used these “gel” bracelets to promote their own causes. Gel wristbands were worn by many of Lance Armstrong’s peers at the 2004 Tour de France. Silicone bracelets have been worn by presidential candidates, news anchors, actors, and athletes across the globe. Even Oprah has worn these popular silicone bracelets, paving the way for their status as a trendy and fashionable item. Since initially introduced, custom silicone bracelets have been adopted as fundraising tools for a wide variety of causes, and have also grown to become a fashion trend in their own right. Our popular color wristbands and custom silicone bracelets provide a fashionable team accessory or fundraising tool for your organization. We can also create custom event wristbands for local and regional competitions, parades, schools, and other organizational events. Custom wristbands are wildly popular, yet simple and inexpensive to produce, making them an excellent choice to sell as part of a fundraising effort. 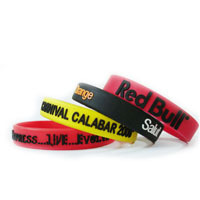 Choose from our custom color wristband designs, or create your own designs. We’ll create a custom silicone bracelet that meets your needs. 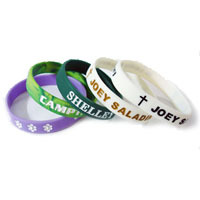 Flexible and stylish, silicone wristbands are one-size fits all, making them ideal for children, teens, and adults. With many popular designs to choose from, excellent customer service, and fast delivery, rely on us to create custom silicone bracelets for your next fundraiser or event.